OK, one anecdote while I’m still shifting back to my normal, antipodean, boring lifestyle. I don’t care if it’s Management, the Italian Mafia, or commandos from the dwarf planet Makemake that are responsible for the flight being cancelled. You wear an Olympic Airways uniform, you apologise on behalf of Olympic Airways. Or you keep whining that both your managers and your customers are the enemy, in which case you deserve your fate. Pfft. What are you worried about? Have you EVER known an Olympic flight to be on time? I’m surprised the flight wasn’t cancelled: it was half empty. Still, we arrived at Zaventem Flemish Airport, more or less in one piece, and more or less within an hour of when we should. Zaventem Flemish Airport sure is complicated to get around; as I was trying to get to baggage collect, I thought I was testing out short-term memory treatments with a tail, pink eyes, and a white furry coat. I did eventually get there, with a whole bunch of Greeks around me chatting blasé about their surroundings; being from the diaspora, it still shocks me that Greece is now in the First World. 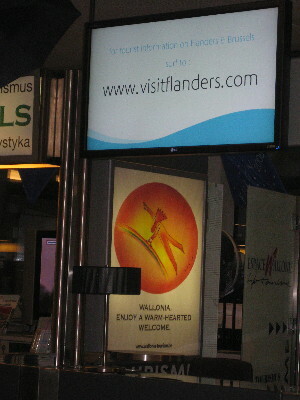 “Visit Wallonia!” and “Visit Flanders!” at the same tourist booth. Just Visiting Belgium doesn’t really seem to be an option on offer. Decisions, decisions: French-speaking Belgium, or Dutch-speaking Belgium? Ah, bugger it, can I get a flight to Eupen instead? German-speaking Belgium, at least, has the advantage of being Neither Of The Above. So the anecdote. I was overnighting at the Gresham Belson hotel, which advertises itself on wotif.com as an airport hotel. Well, it has an airport shuttle. And a screen with airplane departure times. But I’ve got a 30 Euro taxi bill that says “not quite Airport”. Nice enough hotel, but “not quite City Centre” either. Which is OK, I was there to crash and not much else. Because I’d already crashed before even getting off the plane, I wasn’t in the mood for much cultural exchange. No Arglé Barglé Saucisson for me this time; I was going to use the True National Language of the Low Countries: English. Just Call Me imperialist. Or, more to the point, So Over This Travel Bizzo. So I’m in the cab, with an affable enough cabbie (though not Jovially Moroccan), and the following exchange ensues. Remember, No Cultural Exchange. All in English. And Unnatural Attachment to Lambic. ME: So. When did this rain start? CABBIE [Indeterminately Low Countries accent]: You know… I don’t even remember any more. CABBIE: So, are you here on business? ME: No, I was a month ago. Now I’m just flying out of here. Basically I’m going to fall asleep at the hotel. ME: Although if there’s gueuze out there, I may go out after all. CABBIE: Ah, well of course! Brussels has plenty of <foreign lang="en" accent="clouseau">girls</foreign>! 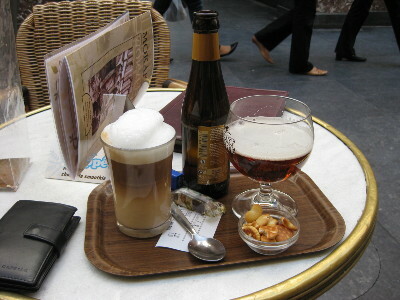 All cities do, of course, but Brussels has… so many different kinds to choose from! CABBIE: But you know, you will have to go into the City Centre. There is not much happening where the hotel is.